At this year’s FESPA Global Print Expo, Ultima Displays will be showcasing its range of award winning Vector LED lightboxes, including an exclusive look at the backlit 30mm design. 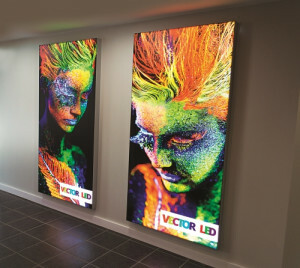 The Vector LED range provides visual impact and can be wall mounted for environments such as a crowded retail space. Each unit is powered by either backlit LED, which allows for even illumination of the whole graphic, or edge lit LED plug and play lights. It is finished with a printed graphic that pushes into the perimeter of the frame. They can be made to order in a range of sizes or custom manufactured to suit customers’ exact requirements. Also on display will be Ultima’s redeveloped Formulate range, which is characterised by its tension fabric graphics and zip system. The range is strong but lightweight, using a 30mm tubular system, that has no visible joints and is double sided. Ultima Displays offer custom designs that are manufactured in-house – delivering impact with special shapes and graphics. The Formulate range can be used for a wide range of applications, since it consists of freestanding banners and backwalls, to complete stands and hanging structures.